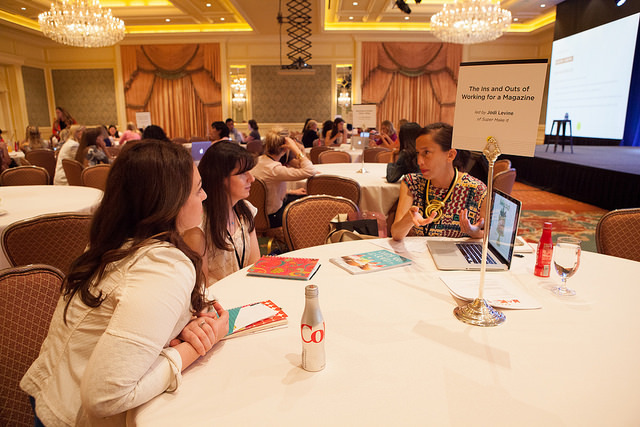 There were so many options when it came to the classes to take at Alt Summit. Pretty much all of them seemed very interesting, but I stuck to the more beginner level ones. Eight classes in all and that doesn't count the roundtables or the opening and closing keynotes. Though I could truly write a paper on each and every class, I know most people don't have time for that, so I'm going to summarize and give you the take-away points that stuck with me. This is still a lot of information, so feel free to bookmark this post and revisit it and couple of times. I arrived mid-afternoon on Tuesday and the Early Bird Sessions started promptly at 3pm. Tues., 3 pm: "Blogging with Bravery: Finding Courage and Your Authentic Voice in the Online World" taught by Tiffany Han of tiffanyhan.com. This was a great way for me to start the conference, because I don't consider myself to a writer. * Be yourself. Don't let what others are doing affect you. "Keep your eyes on your own paper." * Write when the inspiration strikes. Capture the moment and bottle it. Edit later. Tues., 4:15 pm: "Pick Yourself First: Be the First in Line Every Time" by Jenean Morrison of Jenean Morrison Art and Design and Monica Lee of Smart Creative Women. Now, in full disclosure, I actually thought I was going to be in the other session, "Finding your Sparkle" by Nicole Breanna Hudson, a lovely lady whom I had met on the short walk from the light rail to my hotel, but I misread the room. At any rate, Jenean and Monica were great and really spoke to me and addressed some of the hang ups I have. * Sometimes you have to do things you're afraid of. * Educate yourself, but then execute! Don't get stuck in classroom mode. * Don't give away your power. * Ask yourself what you really want. * Be good to yourself and celebrate your successes. 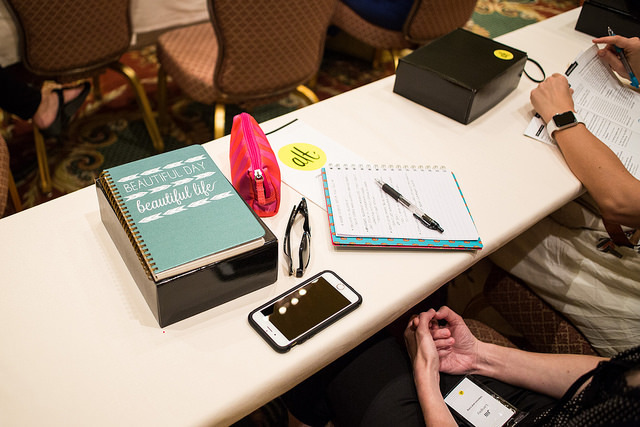 Wed., 11 am: "Community Building" by Nicole Balch of MakingitLovely.com, Laurie Smithwick of lauriesmithwick.com, Cass LaValle of coco+kelley and Leanna Johnson of Polyvore. It's a pretty standard question most people who have a blog or a business ask, "how do I get my name out there and get people to notice me?" These ladies had lots of great ideas and addressed how building a community has evolved. * Put out quality content. * Your blog can still be your central hub, but your community reaches far beyond. * People skim, scroll and consume content very quickly, so make it pop! * Take time to comment and engage with those who take time to comment. * Build community offline and locally through workshops, conferences and events. * Collaborate with other bloggers and businesses. Be friends, not competitors. Wed., 2pm: "Instagram: Growing your Following and Monetizing Options" by Trisha Hughes of Eat your Beets, Jenny Komeda of Little Green Notebook, Kirsten Grove of Simply Grove and Jordan Ferney of Oh Happy Day. Instagram seems to be the social media platform of the moment, especially when it comes to those in the design field. This session was bursting at the seams and was standing room only. * Edit your photos. Make them POP! Right light, right crop, right background, right composition, etc. Use filters and editing apps. * Monetizing through affiliate links like liketoknowit, shopsensit, link in profile (amazon). * Insta Shops - create new Instagram accounts using a related name for selling one off items. * Build genuine relationships by commenting and engaging with commenters. Make connections with other bloggers and "share the love". * Create community hashtags, contests and gimmicks. Wed., 4pm: Roundtables. There were 13 different options for the roundtable discussions and had I completely read the directions that were projected on the screen in the ballroom I would have known that we were encouraged to rotate through and stop at a few tables over the course of the 90 minute session. But I am happy to say that I pretty much spent most of my time talking to Jodi Levine of Supermakeit.com and former Martha Stewart employee. 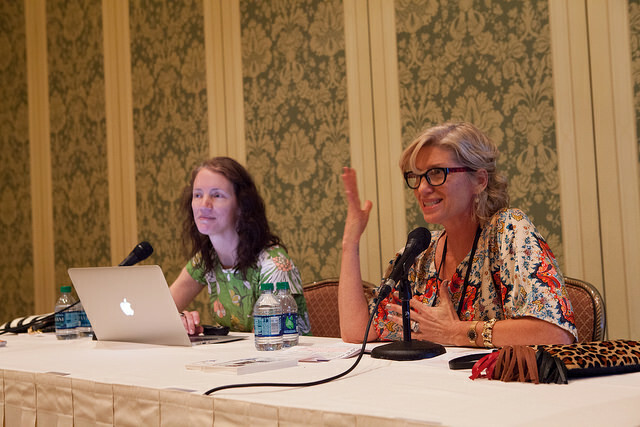 I made a beeline to her table at the beginning and though a few people came and went over the course of the session, I pretty much got to talk to her and pick her brain about crafting, the different ways to showcase your creative work online and, of course, working for Martha for 19 years. I have known about Jodi since I first saw here on Martha Stewart's tv show making a crepe paper flower wedding bouquet, so learning that she was to be at Alt Summit was a bit of a "fan girl" moment for me. 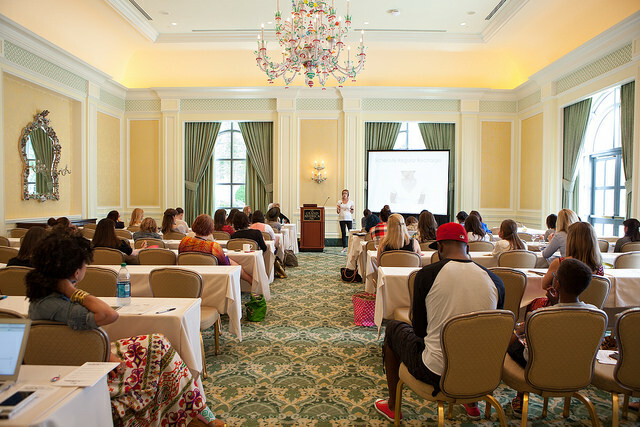 Thurs., 9 am: "Design Camp: Adobe Illustrator" by Alexi Bullock. I'm just going to come out and say, though I completely enjoyed every class I attended at Alt Summit, this class may have been my favorite, because what I learned from Alexi in 90 minutes would have probably taken weeks in any other class. Granted, I do have a decent knowledge of Photoshop, so I'm sure that was a plus, but she presented the information so clearly and through projects similar to what I would be making myself. And to top it off, she gave us links to download all the information she presented in class and then some, for us to look at again on our own time. Well done, Alexi! 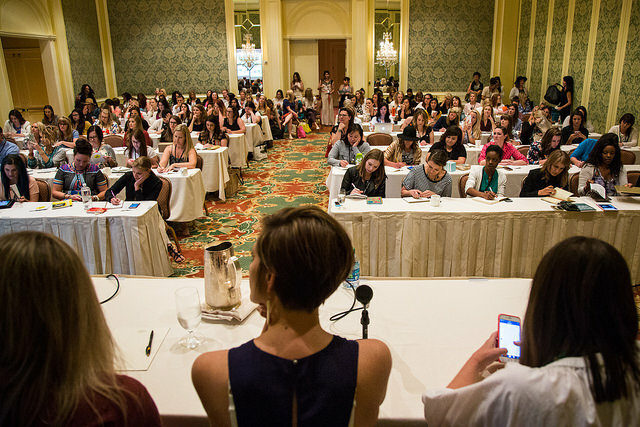 Thurs., 11 am: "Going from Blog to Brand" by Rachel Faucett of Handmade Charlotte and Benish Shah of Refinery 29. Let me preface this summery by saying that I didn't necessarily agree with what Banish Shah presented as it applies to my blog and business and what I hope to achieve. Now she works with a very successful brand in Refinery 29 and obviously there is validity to what she presented, but for me, I do not subscribe to the "one size fits all" philosophy when it comes to design and presentation. She also made a comment about "older women, like in their late 30's like a busy and cluttered look" that stuck a bit of a nerve with me. On the other hand, I really liked what Rachel Faucet had to say. Here are some of the key points. * How do the sites you love make you feel? Infuse that feeling into your site. * Have a consistent message. * Reach out to a blog with similar feel and content. You still with me? It's a lot of content, I know. Only two more class summaries, plus the closing keynote to go. Or bookmark my page and come back later. That's fine, too. Thurs., 1:15 pm: "Self-Managment: Productivity, Energy & Work-Life Balance" by Monique Malcolm of Keep Chasing the Stars, Miranda Anderson of One Little Minute and Samantha Ettus of samanthaettus.com. Now this class could not have come at a more perfect time. Right about Thursday afternoon my brain was pretty much full and buzzing with ideas. Though all of the information I had learned thus far was great, it was all starting to become a bit of a jumbled mess in my head. Learning some strategies about how to approach projects and manage my time, was just what I needed. * Time is external and finite; Energy is internal and renewable. * Automate tasks, "Unimportant Necessaries". Give these tasks a specific place in our schedule and stop thinking about them at other times. Ex. Clean the floors on Thursday afternoon. * Eliminate Unnecessary Decisions. Not everything is important. Ex. Standard meal plan. Taco Tuesday. * Schedule time to recharge. * Work from Home? Set boundaries. Set hours. Set no-tech time. Set a weekly date night. 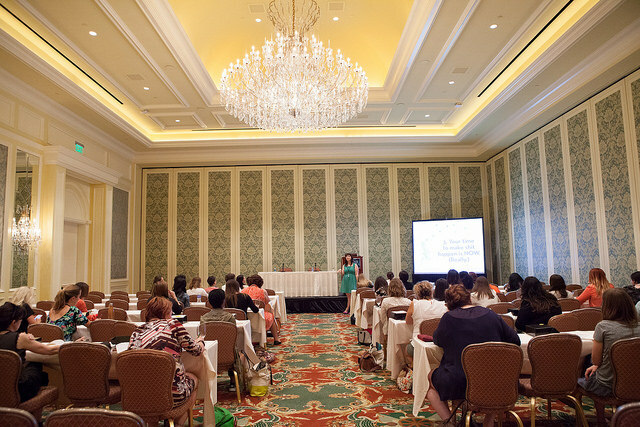 Thurs., 3:15 pm: "How to set Goals for your Business" by Nancy Soriano of nancysoriano.com. Here we go, last class of the conference. As I mentioned before, my brain was full, so I really appreciated the way Nancy presented her information, in the form of a list and the use of powerpoint. I was able to take clear notes to look back on later and really let the information soak in. Here is a portion of that list. * Be action oriented - know what actions need to be taken and by who. * Be time specific - set clear deadlines (weekly, monthly, yearly) and evaluate. * Good managers are good communicators and set clear goals. Wow! Lots of good information, right? Like I mentioned earlier, I pretty much stuck to the classes for beginners, this time. Though I look forward to next time when I'll feel ready to tackle course like "How to Successfully Pitch Content to Magazines and Televisions Shows" and "Creative Collaboration". 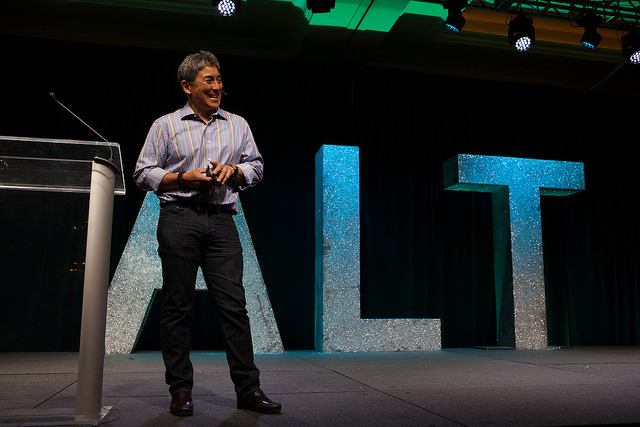 I'm going to close out this post with a summery of the Alt Summit Summer closing keynote given by Guy Kawasaki, creator of Canva and guykawasaki.com. Many people knew of Guy before Alt, but his name and story was new to me. I found him to be very engaging and entertaining. The slides he showed to go along with his talk were fun. 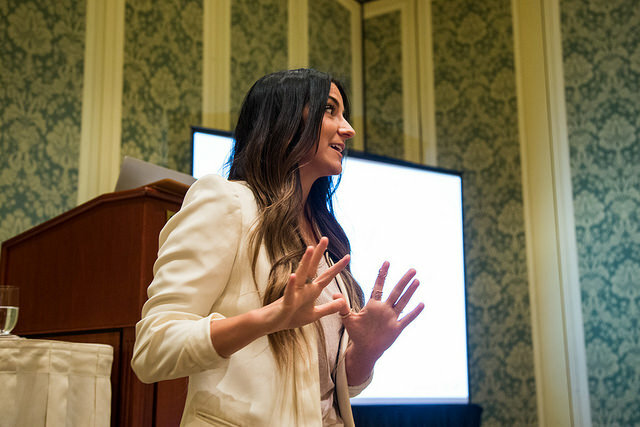 Though some of Guy's hard and fast rules about presenting yourself in business seemed to have rubbed some of the creatives in the room the wrong way, his fun and captivating delivery meant that no one had any hard feelings about it. 1. Perfect your Perspective - Every online profile is your professional profile. 2. Perfect your Avatar - Face only, asymmetrical and front lit. 6. Pictures - Always shoot horizontal, light from front, "crop out the crap"
8. Perfect your Frequency - "Repeat your tweets"
So there you have it... the classes and talks of Alt Summit in a nutshell... a very small nutshell. So much good information and I've barely scratched the surface. I'll be back with part three that will include all the extra curricular activity. The dinners, parties and lounges. Stay tuned!